It’s National Pizza Day! Are you celebrating? If you screamed yes, you’re in luck. I checked in with my own pizza expert to pick his brain on the best pizza options in the Twin Cities. I met Nicholas Kolnik a couple of years ago over happy hour pizzas at Red Rabbit in Minneapolis’ North Loop — can you say perfect segue for this blog post? I’ve never met anyone who loves pizzas as much as Nick. He loves eating them, he loves making them, he loves talking about them — he is hands down the best person to dish out some pizza pie recommendations. Like any child born in the 80s, some of Nick’s earliest pizza memories are linked to Pizza Hut’s BOOK IT! reading campaign. You read, you got pizza. It was an incredibly delicious way to bribe…I mean, encourage kids to read more and one Nick took full advantage of. “Cossetta's, Carbone's in St. Paul Park and Red's Savoy were special occasion destinations in my youth,” Nick said, noting the first thing he ate after returning from a six week trip to France was a large sausage and pepperoni from Little Caesar’s. A huge fan and supporter of restauranteur Ann Kim, Nick was crowned Pizzeria Lola’s first ‘Mr. Dream Pie’ after he won their dream pizza contest — a Cubano pie he ate for both lunch and dinner the day he took home the title. What was on the Cubano pizza? Braised Duroc pork, mozzarella, provolone, pickles, special mustard sauce, and Red Table ham. Yum. Even his travels have been taken over by pizza — he and his wife Kristen put a lot of work into finding the city’s best pizza which can even mean visiting the same place twice. 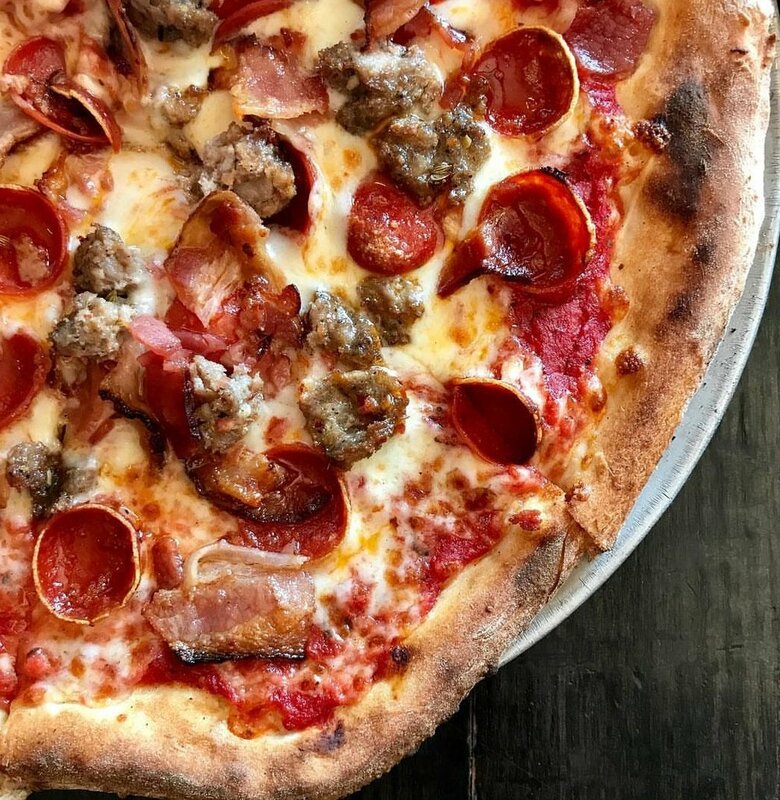 With pizza on the brain, I threw some hypothetical scenarios Nick’s way in hopes of snagging some great ideas on how to properly celebrate National Pizza Day in the Twin Cities. Let's pretend you have a friend coming to town who has never been to the Twin Cities but loves pizza. Where are you taking them and what are you eating? We're going to Pizzeria Lola with a few other people and splitting half the menu: Margherita, My Sha-roni!, Sweet Italian, Marinara, La Creme, Lady Zaza, and whatever the seasonal special happens to be. I rarely experience more analysis paralysis with a menu than when I'm at Lola because it's just so good from top to bottom, so the more the merrier. And there's always room for soft serve at the end of the night because, no matter how many slices I eat, it just finds the cracks. You've had a hard day at work and decide last minute you want pizza for dinner. What's on the agenda? First and foremost: I always want pizza for dinner, but let's roll with the hard day at work scenario. I live and work in the same suburb these days, so my options are a bit more limited. I want to get home and eat the pizza in question on the couch in my sweatpants and I want to do that as soon as possible. I'm probably picking up Davanni's or Gina Maria's and I might not be sharing. I firmly believe the old adage that every pizza is a personal pizza if you work hard and believe in yourself. You and your wife Kristen decide to belly up for a date night. Where are you taking her? On the flip side, where is she taking you? If date night happens to fall during Young Joni's back bar social hour, that's where I'm taking Kristen. The cheese pizza is the best $6.00 I can spend on pizza and the cocktails are always fun and delicious. Kristen is probably taking me to Red Wagon Pizza for a Double Pep or one of our favorite non-red sauce offerings on their menu like the Bahn Mi. Plus their 36 beer taps frequently feature some of the very best options in town. With so many great pizza places in the Twin Cities, what’s your hidden gem? Old World Pizza in Inver Grove Heights. I don't know how hidden it is — it's got a 4.6 out of 5.0 rating on Google with 1,000+ reviews. But I mean, how often do you hear about people gearing up to go to Inver Grove Heights for pizza? Thing is, people should. Old World Pizza has a lunch and dinner buffet and both are stocked with a ridiculous variety of classic and more adventurous topping combinations. It's not just pizza either (but don't be a rookie and overdo it on the filler food). There's something for everyone and it's quite good across the board. You're going to need to wear some pants with some give, you know what I mean? And your wallet isn't going to second guess your decision when the check comes. Do you order delivery? If so, what are you eating? Also, best frozen pizza in the area.